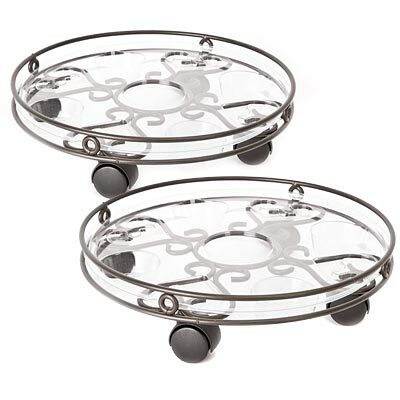 Add a lovely display beneath two of your favorite potted plants using these Panacea Brown Cameo Plant Caddies. A generous, steel frame with a brown, powder coated finish lends a timeless look to each piece, while a plastic tray accommodates your round, oval, or square planter. A dual top ring keeps your planter in place, while additional steel rods form heart shapes on the base for extra strength and style. Casters not only elevate these items off of the ground; they also allow you to move your plants easily for the right amount of sun and shade. Circular depressions on the plastic trays capture any overflowing water, preventing staining on your patio, and the items easily hold 13.5" diameter or smaller pots. The steel and plastic construction is fantastic for use on a deck or in your sunroom, while the bold detailing on these units captures attention. Keep your plants off of the ground using these Brown Cameo Plant Caddies. Note: This case pack includes 2 of the Panacea Cameo Plant Caddies, Brown, 14.25" dia.